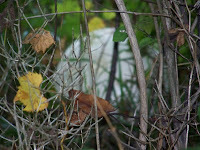 While looking for my lost dog yesterday, I spotted something white in the fencerow, so I stopped the car to investigate. I discovered two giant puffballs. 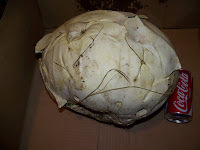 Later, I was able to identify them as Calvatia gargantua. 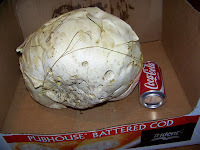 I took the closest one home and took a photo of it with a coke can to show the size - it's larger than a soccer ball. It may already be too late to use it for dyeing, there's a split in it that shows some yellowing of the inside. I was glad I kept it in a cardboard box because a lot of moisture was seeping out of it. I sliced off a chunk of it and found that the inside was a light tan color. To eat it, it would have to be snow white, and I wouldn't be surprised if dyeing would have the same requirement - but I'm going to try it anyway. 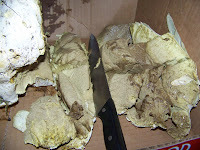 I cut the slice into two inch squares and took the rest of the puffball outside. I put it in a woody area not too far from the house - maybe next year I won't have to be down at the farm to find puffballs. I put the puffball pieces in a pot of water and turned on the stove. 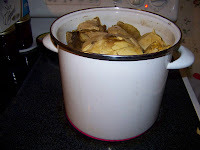 I let them simmer for about an hour. The water had turned a nice brown color when I turned off the heat. I wanted the dyepot to cool before removing the puffball pieces, but it was already quite late and I fell asleep while the pot was cooling. 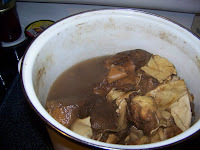 This morning, the water color had cleared quite a bit, so I turned on the heat again and simmered the pot for another hour, then I removed the puffball and put a pre-mordanted piece of wet wool in the pot. 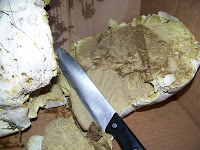 (I took the puffball pieces outside and dumped them in another woody area where it would be nice to find giant puffballs next year.) The wool isn't dry yet, but it looked like it would be a warm and mottled yellow-brown. I was concerned about the color being fast, so I poured in a glug of vinegar, and the wool color changed right away. I'm not sure now that it's going to look any different from a dirty cleaning rag. It will, at least, be mottled. as described :A forum to provide rug hookers and mixed media artists with contacts and communications. Post your artwork, special interests and events. while attending a hooked bag class by Jennifer Manuell (during Deanne Fitzpatrick's Creativity Symposium) I accepted the challenge to develop a register of rug hooking contacts for Atlantic Canada. So here we are...... rug hookers unite! From Atlantic Canada and beyond..... All are welcome.